New Delhi, April 17, 2018: India Tourism Development Corporation Ltd. (ITDC) hospitality major under the aegis of the Ministry of Tourism, Govt of India has today signed a Memorandum of Understanding (MoU) with Jamia Millia Islamia, a Central University to jointly offer a Three-year Bachelors of Vocation (B.Voc) in Food Production and One year Diploma in Hospitality through The Ashok Institute of Hospitality and Tourism Management (AIH&TM), one of the premier PSU Hospitality Training Institutes of the country under ITDC. The MoU was signed in the presence of Ms. Ravneet Kaur, IAS, Chairperson & Managing Director (C&MD), India Tourism Development Corporation Ltd and Prof Talat Ahmad, Vice Chancellor, Jamia Millia Islamia, by Mr. Piyush Tiwari, Director (Commercial & Marketing), ITDC and Mr. A P Siddiqui, IPS, Registrar, Jamia Millia Islamia. The program will be operated under the Department of Tourism, Hotel, Hospitality, and Heritage Studies (DTHHHS), Faculty of Humanities and Languages of the University. The Department offers professional certificate, diploma and degree programmes at undergraduate, postgraduate and doctoral levels in tourism, hospitality and allied areas. Whereas, ITDC and JMI have resolved to deploy these skills and their network of relationships towards capacity building in tourism, hospitality and allied sectors, as well as knowledge-based initiatives in India and internationally. Both the programmes will be jointly offered on a self-financing basis. Three-year Bachelors of Vocation (B.Voc) in Food Production will have multiple exits and entry points. Whereas, one-year Diploma in Hospitality will be divided into 2 semesters; coursework followed with an internship. Programmes will be offered as per the rules and ordinances of the University. ITDC will conduct the in-house teaching and training at its campus situated in Lodi Institutional Area. Initially, admission will be offered for 60 seats each in B.Voc and Diploma in Hospitality Programmes. The intake can be increased or decreased in future on the recommendations of the Coordination Committee. Lateral entry to Level 6 and 7 of the B.Voc programme will also be considered. 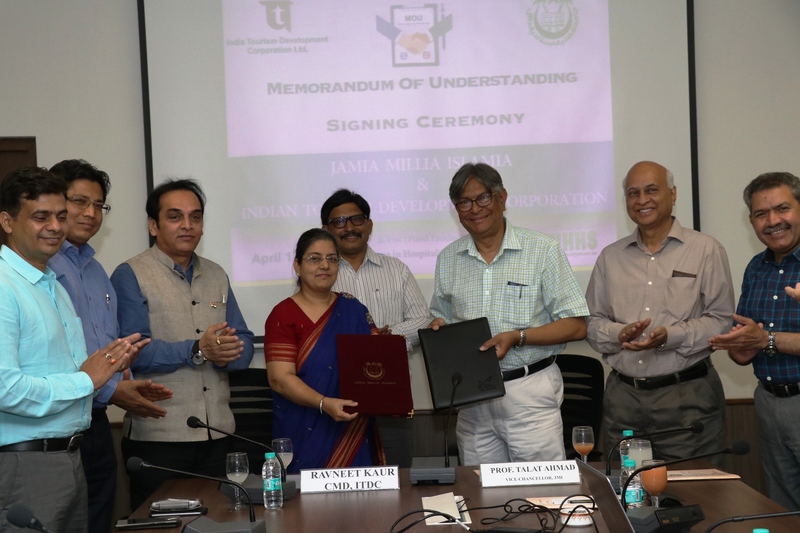 Speaking at the signing ceremony, Mr. Piyush Tiwari, Director (Commercial & Marketing), ITDC said that, “ITDC is grateful to Jamia Millia Islamia for their faith in ITDC’s expertise in hospitality training and management. We are proud that we have been the biggest force to drive tourism in India and have always contributed to nation building and progressive development of the industry. AIH&TM is ISO certified HRD wing of ITDC. Our talented team at AIH&TM has trained more than 28, 000 candidates through its Hotels and industry partnerships. The students are well placed in Hospitality Sector. We are sure that this collaboration of ITDC and Jamia Millia Islamia is going to impart employable skills to students who are aspiring to join the tourism, travel and hospitality sector soon. Our faculty at AIHTM will make sure that students have best of the training in the best-suited atmosphere.” Mr. Tiwari added.